Fly-fishing Costa Rica - Fish rivers, lakes and oceans! Take a break. Breathe in. Explore Costa Rica as one of the world’s fly fishing capitals. This country offers an incredible fly fishing experience for everyone. It doesn’t matter if you’re just starting or you already are a seasoned angler – the excitement fly fishing offers is beyond comparison. 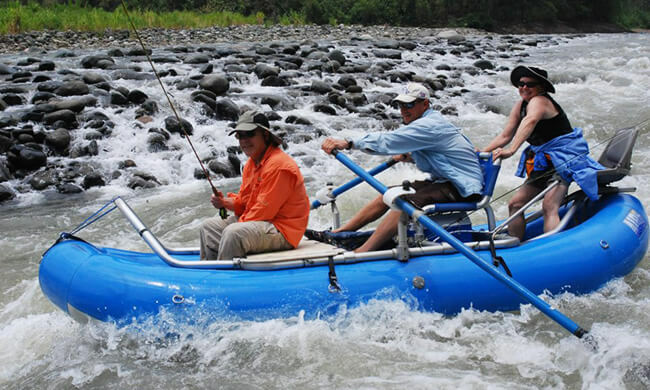 Costa Rica is known as one of the fishing meccas of the world. Although many people are not aware – this country offers some of the finest freshwater and saltwater fly fishing in the world. The country is traversed by numerous rivers and estuaries that are in contact with both the Atlantic and the Pacific. These bodies of water are full of fish that can be caught on fly rods and their size range varies. But what exactly is fly fishing? As the name indicates, this angling method uses a special fly or artificial bait to catch fish. Despite being simple enough for anyone to learn, fly fishing can pose a real challenge to any experienced angler. Since we wish you a breezy, hassle-free fishing experience; we ensure you our experienced staff and superb equipment is present on every trip. Fly fishing is as easy as as casting your fly rod, reel, and specialized weighted line. Once you get the hang of it, you are ready to go! You can try your hand at river rafting while fly fishing on the Savegre River for Machaca (smaller freshwater cousin of the Tarpon). Try your luck at catching a roosterfish on a 12 weight while inshore fishing. If you feel up to it, give a sailfish or tarpon on a fly a go. The fishing grounds here are so plentiful that most fish species here can be caught on fly if you know how. We offer some of the finest guides all over Costa Rica to make sure this happens. As specialists and fishermen ourselves, there is no one better to help you plan your next fishing trip to Costa Rica. Still unsure? Our fishing experts have put together some great resources for knowing when and where to fish. 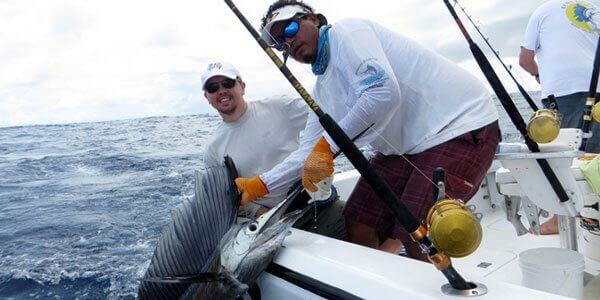 Check out our Fishing in Costa Rica page for a helpful infographic, videos and all you need to know for a great fishing trip. To ensure that you have the best experience possible, contact us today for more information.